Aahhh! 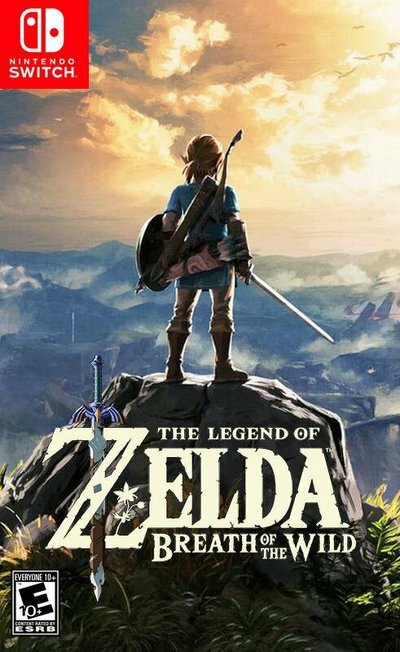 😊 I got my Switch along with "Breath of the Wild" back at the midnight release and have just been loving it ever since! "The Legend of Zelda: Breath of the Wild" is so incredible and immersive, and there is so much food that Link can make! And I love how cute the animations and cooking tunes are, and how adorable Link's expressions are. Many foods have stood out to me as ones I'd love to recreate, but one at the top of the list is the "meaty rice ball", because I love meat! and the look of it is very appealing (okay, I think they're adorable😉). "The sweet and spicy meat stuffed into these rice balls will keep you full for some time." 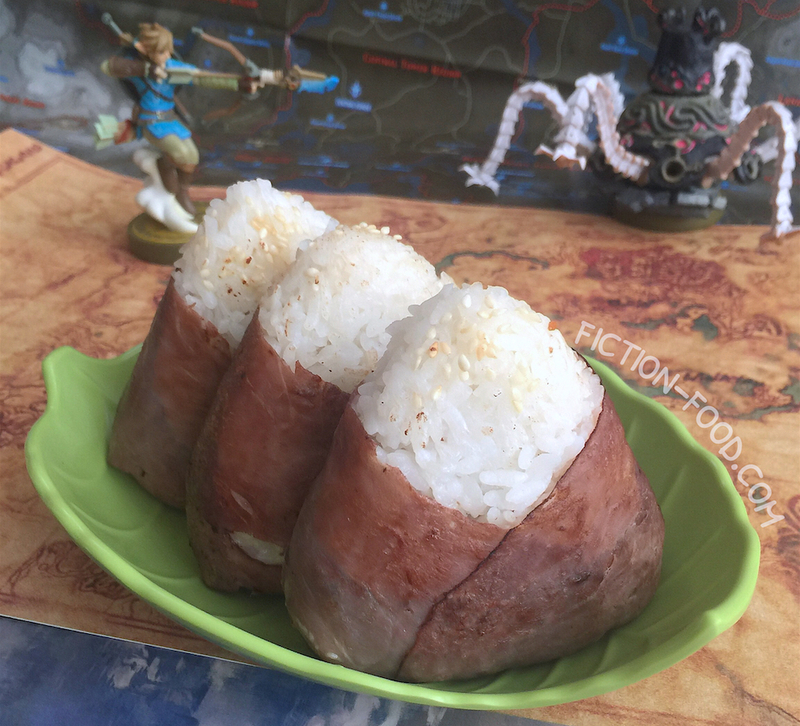 —In-game text, "The Legend of Zelda: Breath of the Wild"
Note: For this recipe I decided to make soboro for the filling because it's cooked in such a way that there's not a lot of meat juice that would sabotage the structural integrity of the onigiri (rice balls). Soboro is ground meat that has the fat rendered and is then cooked so that the added flavors become concentrated. It's perfect for rice because rice is a neutral flavor and you want the filling to be strong to balance it all out. It's also particularly great for this dish because the game says the meat is sweet & spicy, which this is–very flavorful! And if you do decide to add an extra ingredient, like mushrooms or carrots, etc., mince them well & add about 1/4 - 1/3 cup. 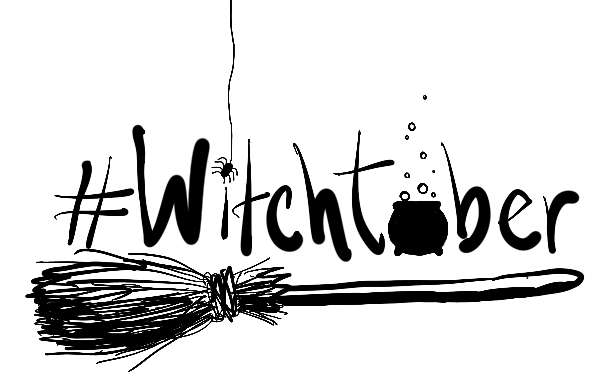 Get ideas from the game and experiment! 1/2-1 Tbsp Granulated Sugar OR ("Courser Bee") Honey! 1. Making the soboro: In a small pan over medium heat, cook the ground beef, making sure you break it up very small, until no longer pink. Drain the juices & plop the meat onto a large paper-towel lined plate. Place another paper towel on top of the meat & press to get out more of the juices. Us the paper towel to wipe out the pan, & then return the meat to the pan. Add in the seasonings; mirin, chili pepper, sugar or honey, & soy sauce, & then toss to fully incorporate into the meat. Let cook until the juices are evaporated & the meat has become very flavorful. 2. Building the onigiri: Have a little bowl of water handy to dip your fingers in so the rice won't stick to you. Line a small bowl with a large sheet of plastic wrap & flick a little water onto it & sprinkle on a little salt or garlic salt. Scoop out 1/2 cup of cooked rice into the plastic lined bowl & then make a well in the center to put about 1 Tbsp. of the soboro meat mixture. Put just a little more rice on top to cover the meat & then gather up the edges of the plastic wrap & lift it up, twisting the plastic closed. With the rice in the plastic, press & shape it into a tight/compact rounded triangle with no meat showing (feel free to add little bits of rice to cover up any exposed meat if necessary). Unwrap the onigiri & lay it aside n a plate or tray until ready for the next step. Continue shaping onigiri until you run out of rice (will make about 5 or 6). 3. You'll need 2 slices of roast beef per onigiri (if you're using sandwich meat slices). Lay one slice of meat flat & spread it lightly with mayonnaise on one side (the mayo will act as "glue", plus it's a very common onigiri, & Japanese food in general, addition). Fold & press this slice around the bottom & back of the onigiri, mayo-side to rice, adding a little mayo to hold the folded bottom corners (see photo). Next, cut the second slice of meat in half lengthwise & spread mayo on one side of both pieces. Starting at the back & folding around to the front, press these pieces diagonally around the sides of the onigiri (like putting a shawl around shoulders. You're totally dressing these onigiri up!). Use your finger to spread a little mayo under flaps to make everything stick and press down smoothly. Lastly, to more closely match the in-game image, press some sesame seeds onto the apex of the onigiri. 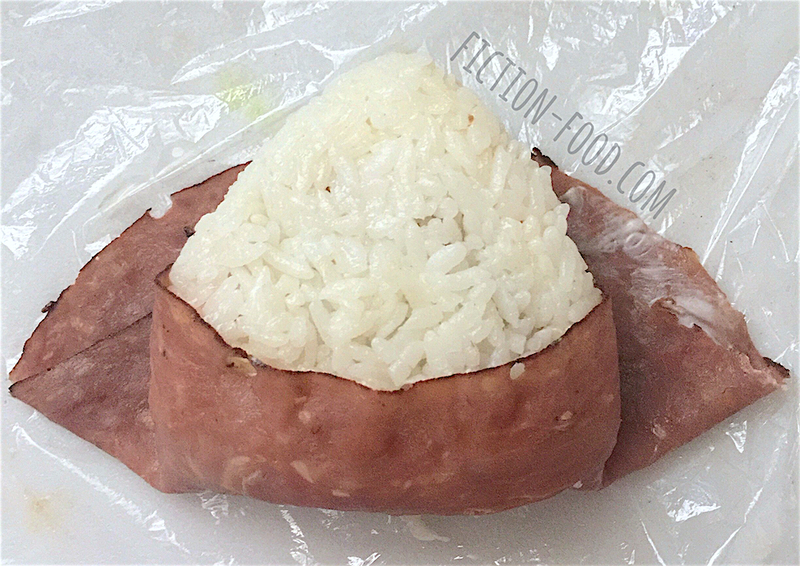 Wrap each of the onigiri in a meat coat and sit them back on the plate or tray for the next step. 4. Clean well the little pan you used previously & heat it on medium-low. You can use your fingers for this step, but be careful of hotness! or you can gently use silicone topped tongs or keenly use a fork or spoon, whatever you're comfortable with. The goal is to lightly cook & seal the meat around the onigiri (you could leave the onigiri as is, but it's cooked in the game & it tastes delicious this way). Sit 1 onigiri in the pan on its meat-covered bottom & let it cook for about 30 seconds or so, until the meat is just browned & sealed together. Rotate to one side, cook, & then the other side, cook. Lay it on its back & cook, & then gently roll/flip it onto its front & cook. You don't want to brown the rice, simply lightly cook & seal together the meat. Remove the finished onigiri to the serving plate/tray, quickly wipe the pan clean with a paper towel, & then repeat the process with the next onigiri, & so on. Great eaten freshly made, but also good room temperature, like if you're taking them on a picnic or packing them in your work/school lunch. Store in an airtight container. 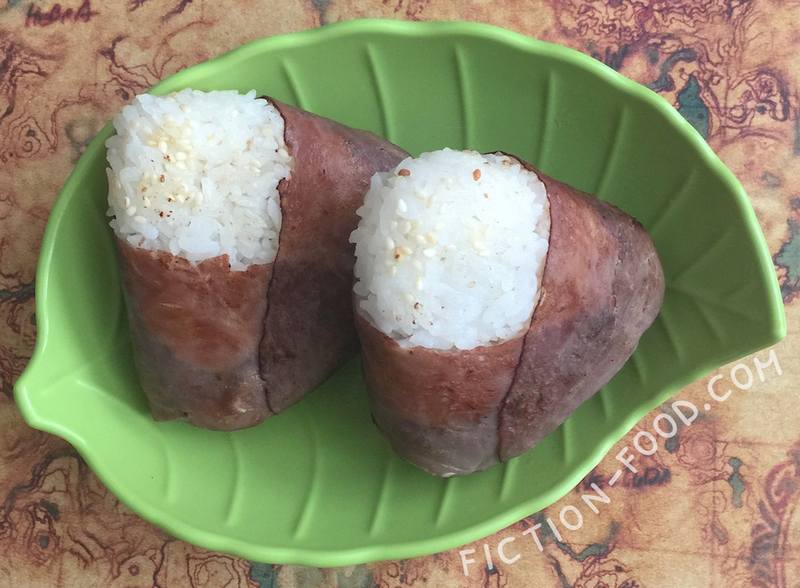 The meaty rice ball looks so appealing.I think its time I get into the kitchen and start cooking already.Thanks for sharing the recipe. Wow, those look both adorable and tasty! I might have to make them sometime. I can spend about 30 minutes to an hour making food in the game anyway, and the food looks delicious. Ah, sorry--most of my friends can't stand spicy food. 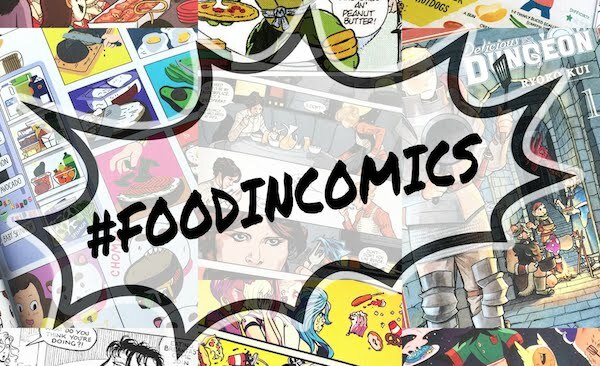 What would you recommend instead of chili pepper/paste for flavoring? I could--but it would be less flavorful. What do you think would work as a non-spicy flavor with these meats? Can you use coconut aminos? Nina! I keep replying to your comment, but for some reason it never shows up!